After months of hard work on improving our author profile pages, we are happy to present the new design and features and to answer the most important questions you might have about the new pages. How do I get to the author pages? 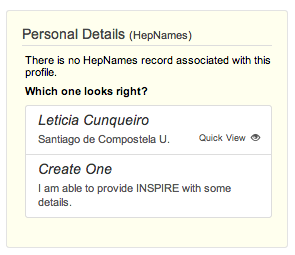 Using the HepNames collection and click the author profile link. However, if after clicking Author Profile you land on the Person Search page instead, you will be presented with a choice of authors. Pick the best match and click “Publication List”. Using the HEP collection, click on any author’s name. If you are already browsing an author profile page, you can find others by using the search bar in the top right corner. As a regular user, the first thing you will notice is that the information appears now re-organized. It is displayed in three main columns: personal information, publications and output, and stats. We think this reflects the feedback we got from you in our usability testing sessions in the best possible way. The layout will adjust to your screen size automatically so you might not always see the three column structure. In the publications box, you will find more material integrated: data sets and other publications, even outside INSPIRE’s scope! 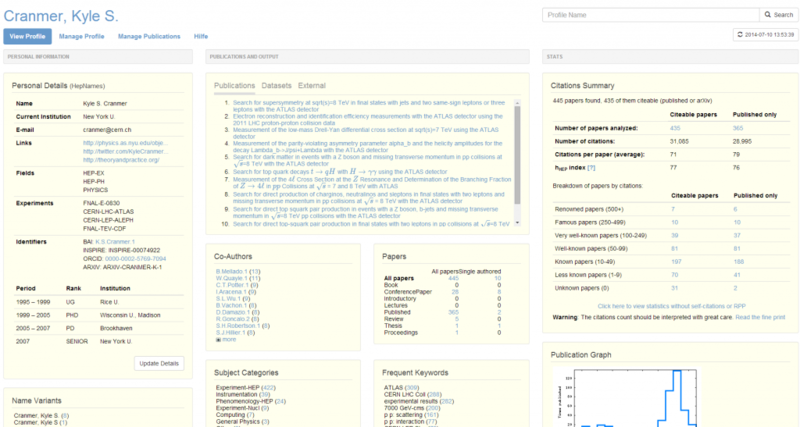 In this way your profile is more complete and reflects your research activities better. We also changed the layout of the “Personal details” box. Your field, experiments, and institutions are now arranged in an easy-to-read and easy-to-update style. Where does the information on my profile page come from? The profile is built by an algorithm that extracts information from the papers assigned to the profile. However, all personal information is curated by our staff. We want to keep it accurate! You can always help us by providing more information about yourself or your publications. What if my personal information box is empty? If your author profile is not yet linked to a record in our person database, the personal information box will look like this. You can either select the best match or, if none of the suggested records fit or you don’t get a suggestion at all, you can create a new record. If, by mistake, your author profile is connected to the wrong person record, send an email to authors@inspirehep.net and our staff will fix it manually for you. The “Manage profile” page allows you to merge profiles, connect to ORCID, manage your personal information, and contact us for help if you should get stuck and our help pages don’t get you any further. Click “Manage Profile” below your name on the author page. After logging in with your arXiv account you can get it linked with your author profile in INSPIRE (you just have to do it once, of course). If you don’t have an arXiv account, you can also proceed as a guest. In that case, an INSPIRE staff member will have to approve your input, which may take longer to appear. For every question not yet answered, feel free to ask it as a comment here or share it with us at feedback@inspirehep.net. We’re always interested in suggestions on how to improve INSPIRE. If you are interested in being a tester to give us feedback in usability sessions, we would welcome your participation. Thanks to your numerous responses to our survey earlier in the spring, we have understood the most common challenges you have with the search syntax of INSPIRE. Thus, we have compiled the following suggestions for your searches – please try and let us know what you think. You also had some questions on author searching as well. We would like to point out that the sophisticated SPIRES-style author searching also works in INSPIRE. For example, “j ellis” or “ellis, j” will give the same result. But the more precise you make your search, the more precise your results are. If you include a middle initial, results will be restricted to match only with records that also have the middle initial. Including the full given name will restrict the search to match only on the initial or the exact given name. Another way to search for an author is using the Invenio syntax: author:”j ellis” (for further guidance on author search, check here). For more search tips, check here. Feel free to contact us at feedback@inspirehep.net if you still have any questions. The large collaborations at the LHC have an unusual intermediate form of publication: the conference note. These are significant results prepared by the collaboration for major international conferences (not to be confused with proceedings written by a conference attendee). They are heavily peer-reviewed within the collaboration, signed by the collaboration as a whole, and often precede submission to a journal. Moreover, these conference notes typically provide more detail than the documents submitted for publication, which makes them particularly valuable to anyone following the research closely. However, finding these conference notes has confounded almost everyone that has looked for them. They are “catalogued” in a maze of wiki pages, plain HTML pages, and various categories in the CERN document server (CDS). While CDS is based on the same underlying Invenio technology, it lacks much of the functionality that INSPIRE offers. In particular, there has been no way to easily navigate references, track citations, or generate bibliographic information. This situation improved dramatically when both ATLAS and CMS agreed to put these conference notes into INSPIRE. There are already more than 800 conference notes indexed, with many more to come! Now, I can easily track citations to a recent conference note on the Higgs decaying to photons; perform a full text search for the word “asymptotic“; and see which ATLAS conference notes have been cited by CERN theorist Christophe Grojean. As an author of several of these conference notes, I am particularly excited about the ability to generate standard bibliography entries. For example, I can easily export a .bib file for all the 2012 ATLAS conference notes. This will be a huge time savings for the collaborations and a great example of the impact an excellent literature database can have! Once more, we extended the information we provide on our author profile pages on INSPIRE. You can now find subject categories among other information such as affiliations and co-authors. Furthermore, we provide you with a graph showing the numbers of publications per year. You might need to clear your browser cache to see the graph. As it takes a lot of processing to calculate this information, we precompute them regularly for your convenience. In the bottom right corner of the page, you can find the date the page has been generated and a link to recompute it to get the most current information on an author. To access these author profile pages and see our novelties, just click on an author name the next time you do a search on INSPIRE. If you think there’s still information missing on these pages or have other comments and questions on author pages, don’t hesitate to contact us at feedback@inspirehep.net. Our new, fast-loading author publication profile pages, e.g. 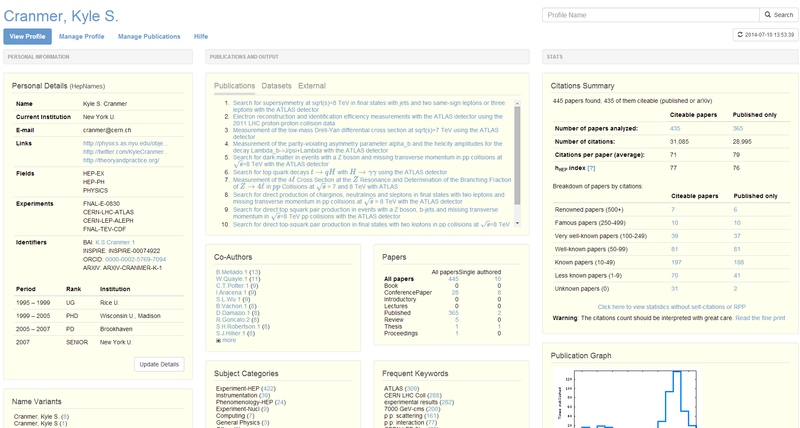 http://inspirehep.net/author/R.P.Feynman.1/ provide a comprehensive overview of a person’s publications including citation summary and co-authors. This information is now available to full extent as the boxes showing keywords etc. can be expanded by clicking. For your own page, it will allow you to claim your papers and make sure your list of publications is complete and accurate. Furthermore, the new pages combine INSPIRE’s publication information with the HEPNames biographical entry for the person. In some cases where we aren’t sure of the exact matching between the author page and a HEPNames entry, we offer a list of possibilities with the option to identify one of them as the right one or add a new one. More information to the HEPNames entry can be added by clicking on the blue update button and your help here will be greatly appreciated! To see these pages, just click on an author’s name the next time you do an INSPIRE search. And of course you can let us know how you like the new profile pages by sending mail to authors@inspirehep.net. Because collaborations have a lot of authors, many searches for theorists and other authors not on a collaboration will also return papers by collaborations where someone has a similar name. If you are looking for papers by the full collaboration, individual members of the collaboration write a lot of conference papers and these will also show when you try to find the official results of the full collaboration. As always, INSPIRE allows you to use author-count in all kinds of searches to get just the result you want. P.S. You can also figure out the citation summary for the papers that, for example, Richard Feynman wrote alone with find a feynman and ac 1. How do you know if a citation of one John Smith is the John Smith you’re looking for? What if it’s a citation of J. Li, an even more common name? The task of “disambiguating” two authors with the same name is a tough challenge for a computer, but INSPIRE is making great strides on this front. In fact, an algorithm has been developed to solve name ambiguities. The secret of this algorithm is the use of an extended probability model to combine various properties of similarity. For example, a set of papers can be split into the papers about astrophysics versus the papers on B mesons. The person with the same name in both sets might be two different but identically named people so we’ll split the records along those lines and just give you the set you’re looking for based on other criteria in your search. The key to success is to ask the authors of the research community to approve their publication lists. The motivation for asking the community is that we think the authors know best which publications are actually theirs. This hybrid approach of the algorithm and the users’ participation in the project allows for the most precise publication lists and stats. We now offer a link on the author page to make these kinds of corrections. If you do see something wrong, please take a moment to correct it so we can make the database more useful and informative for you and for everybody else.